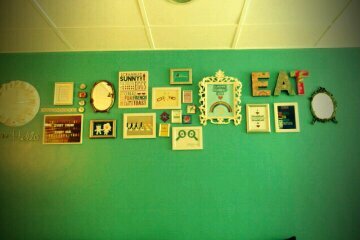 You want to know the sunniest resto in the metro? It’s “Milky & Sunny” in Pasig City. 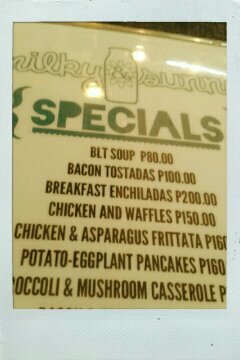 They serve all day breakfast meal like cereals, rice-egg meals, pasta and many more. The place is really cozy. It has a lot of frames and cute stuff on it. It is blue and I love blue that’s why I enjoyed staying there. 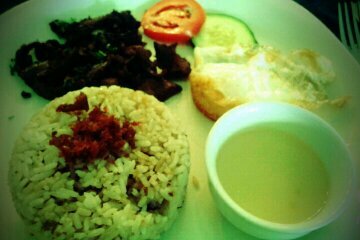 I ordered Tapa with rice and egg, in short Tapsilog. Hehe I guess the price is a little bit pricey for a Rice-egg meal but anyways I want to try more of their food. The unlimited cereal is really cool though even though I’m not a cereal kind of a girl. The cute frames. It makes the place cozy.